SURIGAO CITY – Davao del Norte Rep. Antonio “Tony Boy” Floirendo Jr. has yet to seek the endorsement from Davao City Mayor Sara Duterte after announcing his interest to become the next leader of the House of Representatives this coming July. 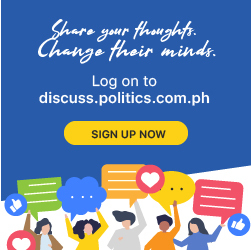 “He didn’t ask for endorsement pero lahat ng sumusuporta sa administration ni President Duterte ay sinusuportahan natin,” Duterte said during an interview in Surigao City. The Presidential daughter and Floirendo were reportedly involved in the ouster of the Davao del Norte first district Rep. Pantaleon Alvarez from the House leadership in July 2018. Floirendo expressed his desire to seek the House leadership not only to correct the “big mistake” he committed when he endorsed Alvarez as Speaker to Duterte in 2016 but also to ensure that chief executive gets solid support from the lower chamber. Meanwhile, Mayor Duterte stressed that she finds it weird when several potential front runners for the Speakership seek her endorsement even though she’s not a member of the Lower House. “Hindi ko alam bakit people seek endorsement sa akin. Hindi naman ako part ng House of Representatives. Hindi naman ako tumatakbong congressman,” said the Davao City Mayor. Duterte said she doesn’t not say no to persons seeking an endorsement as long as they are supportive of the Duterte administration. “So sa akin lang naman kapag lumalapit, I don’t say no especially kapag publicly, nakikiusap publicly,” said Mayor Duterte. During the course of Hugpong ng Pagbabago’s (HNP) nationwide campaign caravan for its senatorial bets, Mayor Duterte has endorsed at least two personalities on stage as her bet for the Speakership. They are Marinduque Rep. Lord Allan Jay Velasco and former Leyte Rep. Ferdinand Martin Romualdez.